If you happen to be in Detroit through the end of November, you might notice something a bit different about the iconic Spirit of Detroit sculpture. 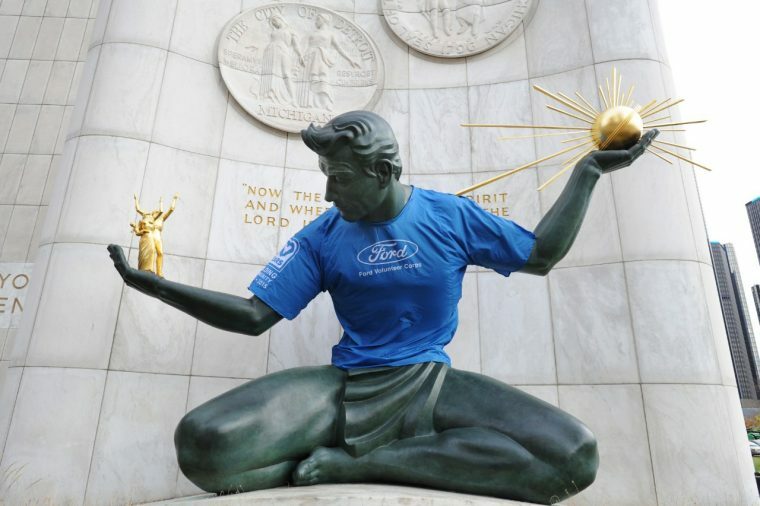 Namely, the 26-foot bronze statue of a loin-clothed man holding up tiny bronze people in its right palm and an exploding Death Star in the left is suddenly decked out in a blue Ford Volunteer Corps shirt. This is an effort to celebrate a decade of the Ford Volunteer Corps and its embodiment of the same spirit that the statue represents. Ford also announced today that it will once again have a significant presence in America’s Thanksgiving Parade; with the theme of “Innovation through Performance,” Ford will lead the parade with a 2016 Ford Shelby GT350 Mustang and Focus RS, and more than 40 Ford F-150s and other Ford vehicles will be pulling floats and carrying people all along the float’s route. Ford will also have its own float celebrating 10 years of the Volunteer Corps and highlighting the new vehicles of the Ford Performance Brand.